Let me share this photo quotes from lifelovequotesandsayings.com . A friend shared this photo in my Facebook and I agree. 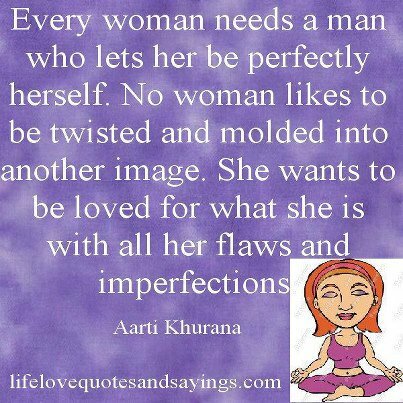 "Every woman needs a man who lets her be perfectly herself. No woman likes to be twisted and molded into another image. She wants to be loved for what she is with all her flaws and imperfections." Every woman really needs a man who can let her be a woman. No woman wants to be manipulated by a man to change for what she is. Love her flaws and imperfections. That's true love.